John Shepherd lost the love of his life on the Oregon Trail. Now, struggling along with young baby daughter, Suki Shepherd, he relies on the women of the towns’ kindness, to look after Suki while he builds a home for them both. Josie Lane, a teenager, newly orphaned on the Oregon Trail found herself almost a slave to the family that rescued her. Working for no pay, but a roof over her head and food in her belly, she saw no means of her life ever changing. Yet within a couple of years she was given a new option in life. Stay where she was, or work as a housekeeper for a single man and care for his young baby. Baby Suki was a dream to care for. John Shepherd not only gave her a place to stay but paid her as well! He let her continue to do laundry and her dreams of a family of her own were getting closer. Could this dream get any better, or will it come crashing down around her? 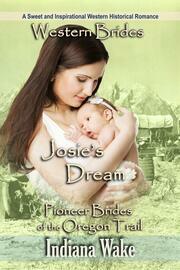 Find out in Indiana Wake’s new, sweet, clean, inspirational, historical, western romance Josie’s Dream.